Total distance: 1700 km (1060 mi); total altitude gain: 17 km (12 mi). Tour date: August 1999. I met with two friends ( Wolfram and Robert) in San Francisco, where we took a night train to Klamath Falls. I reserved the seats ahead; on this particular route bicycle reservations are unnecessary but since they use a shuttle bus from San Francisco to the station in Emeryville, we had to ride there and pack the bicycles in boxes they sell. 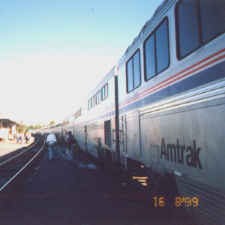 Unlike typical urban commuter trains, the train was modern and clean, with the look of an airplane business class cabin. The seats were not really comfortable enough to sleep well in though. From Klamath Falls we rode north on highway 97 alongside Klamath Lake, which got rather busy after a while. We turned right at Modoc Point and followed a pleasant little side road until highway 62, which we followed all the way to the Mazama campground below the rim of Crater Lake. The train ride brought us up into the mountains, but we still had about a vertical kilometer to climb that day. 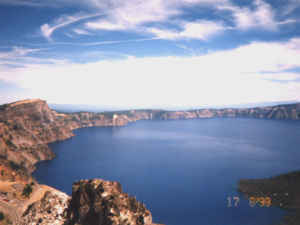 We saw Crater Lake the next morning, after another 400 meter climb to cross the rim. The top and middle picture to the left were taken when riding up the caldera (rim). 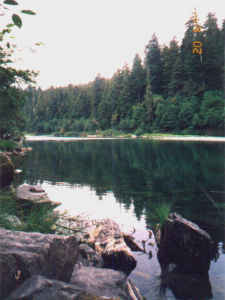 Crater Lake is almost circular with a small island. There used to be a volcano there long ago, but its top blew off and left a very scenic lake. Due to its depth it is incredibly blue. In the summer (we rode in August) it is possible to ride around all around the lake; in the winter this road is closed. At the western side there is a mountain with a great view of the lake; the teaser image at the top of this page was taken there. Even in August there is snow there, and the path up the mountain is too rough to ride with road bikes. After a day at Crater Lake, we followed highway 62 towards Medford. 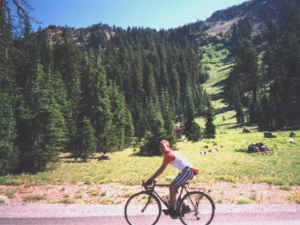 The ride was an exhilarating downhill through dense forest, sometimes alongside lakes or white water rivers and creeks. The bottom picture on the left shows me crossing a bridge. The area is almost completely unpopulated, and there was suprisingly little traffic (this was on a Wednesday, I expect it would be worse on weekends). We stayed one night in a campground in the Valley of the Rogue, and continued the next morning to Medford. We did not enter Medford and instead followed small side roads through Gold Hill to Grants Pass. 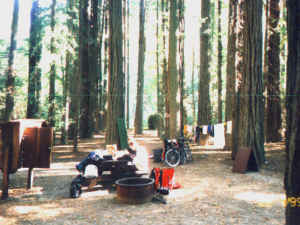 Finding the campground at Jedemiah Smith Redwoods State Park was rather difficult; it is at the end of a poorly marked road turning off to the left from our road about three kilometers before Grants Pass, crossing underneath the freeway and leading into a small and rather windy recreation area without hiker/biker sites. If you pass a sawmill or ride into town, you went much too far. After Grants Pass we followed highway 199 to Crescent City. This is a rather busy road but not a divided freeway, so the traffic was not too bad. There are very few roads in southern Oregon - most of it is untouched nature - and the only alternative would have cost us several extra days. We did not visit the Oregon Caves because we were told they are rather overrated, choked with tourists, and at the end of a long hard climb. Instead, we crossed the Californian border about halfway to Crescent City. They have a full-blown border station there in order to catch and punish those who are irresponsible enough to import fruit from Oregon to California. We spent the night at Patrick Creek State Park. Never ask a local for distance or steepness of a road. They will invariable reply with some obviously wrong number of miles and assure you that you have all the climbs behind you. 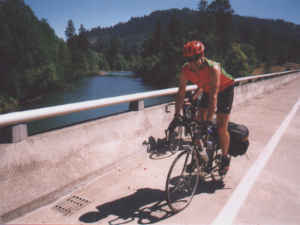 The ride from Grants Pass to Patrick Creek was memorable: we woke up with about five degrees C, rode through the flats with the bicycle thermometer peaking at 44 degrees, then had a long climb to the Californian border that just didn't want to end. After crossing the border, there is just a little more climbing, and the rest is another glorious downhill through gorgeous redwood forests. 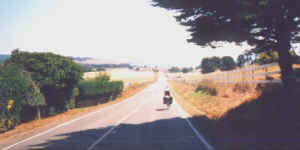 Most of the roads there were being resurfaced in 1999, and had excellent quality, if still oily and covered with loose gravel. We had plenty of opportunity to contemplate what must be one of the least desirable functions in nature: Stop Sign Bearer, Master of the Destiny of all cars that pass the construction area. They just sit there, waiting, and stick either the "slow" or the "stop" side of their sign into your face. Sometimes they radio ahead to the next Stop Sign Bearer to sync up. The famous American job machine at work, generating employment in the service sector. Friendly guys though. The next morning we rode the remainder of the distance to Crescent City. 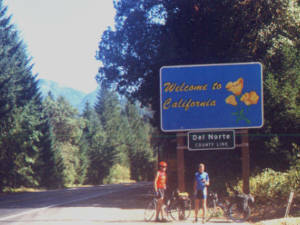 Here this tour joins with another West Coast tour from Seattle to San Francisco. 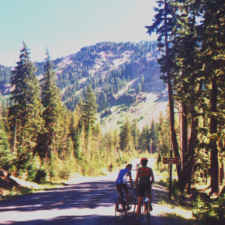 From here we followed the routes and campground recommendations in the guidebook ``Bicycling the Pacific Coast'' by Kirkendall and Spring. Highly recommended. Crescent City is unremarkable, but it marks the beginning of the Redwood State Park. We rode through Eureka, which offers a number of restaurants but otherwise little reason to stay. We followed the small side streets recommended by the guidebook instead of the busy highway 1, and later the Loleta alternate route. After Scotia, we left highway 1 and turned left into the Avenue of the Giants, riding past huge old-growth redwood trees. There are tourist attractions all over the place, such as various drive-through trees and very dubious wood art. That night we stayed at the Marine Garden Club Grove just before Weott, sleeping under huge trees, shown in the picture to the right. Again, the campground is hard to find; we first had to ride to the main park for registration and showering, and then 2.7 kilometers back to a tiny sign on the left pointing into the forest. While the main park was pretty full with campers and screaming kids, we had the Marine Garden Club Grove all to ourselves. That campground is one of the reasons why I enjoy touring at the US west coast so much. It's in a park big enough to put a small European country in, and unlike the sparse and windy car campgrounds one sees so often in places like France, it was spacious, with small groves and trees all over, and areas reserved for hikers and bikers. Nothing is worse than sleeping on a parking lot between other people's cars. This one was the opposite - pure nature all around and no sight of a car. When the Avenue of the Giants rejoins Highway 1, we had to deal with heavy traffic on a wide road. Again we took an alternate route, Benbow Drive, which winds back and forth around the highway, and later another one marked Highway 271. We actually took the wrong turn there, which added some unnecessary climbing, but as the picture on the right shows these roads are quiet and scenic. The yellow-brown fields are typical for California in the summer; Oregon had been uniformly green and forested but as we progressed south, the landscape was positively bare and sunburnt in spots. After some more climbing, we reached the Standish-Hickey State Recreation Area. It's a fairly busy campground but as cyclists we got a quiet site. There is a path down to the river, shown in the top left picture, which widens upstream and is deep and warm enough to swim. The next day we reached Leggett. US 101 forks off from Highway 1 here, which means we left the traffic behind as we climbed Leggett Hill. It is the highest on the west coast, but it is actually quite manageable. Going north would be much harder. We spent the night in Russian Gulch State Park, which is a very large campground with a remote and empty hiker/biker site. All sites are beautiful small groves (middle left picture) with dense underwood and trees all around, very cozy. There are lots of paths up some hills and down to the ocean. We had a reservation for the Point Reyes youth hostel and were now seriously ahead of schedule, so we rode short distances. Our next stop was Bodega Dunes Campground, just before Bodega Bay. Try to be there on a weekday - the town is close enough to San Francisco to be flooded with visitors from there, and the restaurants are overpriced and not very good. 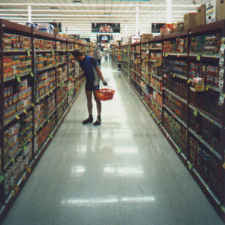 Near the opposite end of the town there is a small grocery store at the top of a hill. 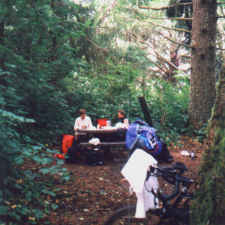 The campground is very sandy and the hiker/biker site is small, but there are enough trees to protect against the wind. Point Reyes is a nice little town at the edge of a national park. The youth hostel is deep in the park, and although I had been there before I did not recall just how long and steep the hills are we had to cross to get there... The youth hostel itself looks nice but it's rather remote and we were not lucky with the other guests. Good thing I always bring earplugs. I suppose this was the last time I stayed there. The next day we rode to San Francisco, using Sir Francis Drake Boulevard through the Marin County hills instead of Highway 1, which is far too busy and dangerous. We followed an intricate sequence of instructions in the guidebook that kept us on quiet roads whenever possible and away from the heavy traffic so close to San Francisco. We would never have found it without the book. Finally, we reached Sausalito and crossed the Golden Gate Bridge to San Francisco, where we had made reservations in the Mason Street youth hostel. The picture to the right was actually taken before Bodega Bay, I was just running out of space up there. 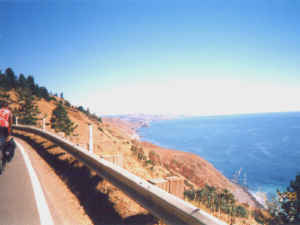 It shows Highway 1 with its many views of the Pacific ocean. We planned to take Highway 90 to Half Moon Bay and then follow Highway 1 to Santa Cruz, perhaps with a stop at Pigeon Point. Unfortunately, Highway 90 had been closed for bicycles the year before, and the road is narrow and carries very heavy traffic so we didn't feel like riding it anyway. This left only staying on Skyline. First we had to cross King's Mountain, one of the highest points on the peninsula. We stayed on Skyline until turning right into Old La Honda road, which is just after La Honda Road (Highway 34). Old La Honda eventually merges with La Honda but is very quiet and scenic. The change of plans made this stretch unexpectedly strenuous. We gained more altitude that day than on any other day (over 1600 meters), but the scenery was well worth it - Highway 1 is busy and rather boring and treeless, while we were riding in forests with little traffic. We finally managed to find a place to stay in San Mateo County Memorial Park. There is no hiker/biker site, but we had no choice as it was getting dark, and we got a very nice site away from cars, in the forest. Recommended. At night some raccoons tried to steal food. The next morning we rode into Santa Cruz, using Highway 1. I couldn't find the youth hostel where we had reservations - it turned out that it had moved to a much nicer place on Main Street. (The only difficulty was that Main Street is a tiny street that nobody in Santa Cruz seems to ever have heard of.) It consists of a number of luxurious new cottages in a very nice garden; this is one of the best youth hostels I have ever been in in the US. We left Santa Cruz the next morning on Highway 9, which climbs up to the south end of Skyline, not too far from where we had turned into Old La Honda two days before. There are a number of bakeries in Boulder Creek halfway up Highway 9. We then followed Highway 9 down to Saratoga and through the Silicon Valley for purely touristic reasons, but I can't really recommend doing that - large freeway-like streets, lots of traffic, and not much to see except the occasional well-known company logo. Part of our ride that day included the streets where I used to commute to work many years earlier; it was nice to see it again (if it can be called nice to see the Central Expressway again). 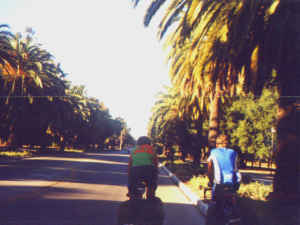 After visiting Stanford (the left picture shows Palm Drive, which leads to the main quad), we eventually used CalTrain from Palo Alto to return to San Francisco; riding this distance on Skyline would have taken too much time that day, and El Camino Real, the main non-freeway artery in the peninsula, is too narrow and busy much of the way for riding a bicycle.